There are various types of cement used in concrete construction. Each type of cement has its own properties, uses and advantages based on composition materials used during its manufacture. Ordinary Portland cement is the most widely used type of cement which is suitable for all general concrete construction. It is most widely produced and used type of cement around the world with annual global production of around 3.8 million cubic meters per year. This cement is suitable for all type of concrete construction. Portland pozzolana cement is prepared by grinding pozzolanic clinker with Portland cement. It is also produced by adding pozzolana with the addition of gypsum or calcium sulfate or by intimately and uniformly blending portland cement and fine pozzolana. This cement has high resistance to various chemical attacks on concrete compared with ordinary portland cement and thus it is widely used. It is used in marine structures, sewage works, sewage works and for laying concrete under water such as bridges, piers, dams and mass concrete works etc. Rapid hardening cement attains high strength in early days it is used in concrete where formworks are removed at an early stage and is similar to ordinary portland cement (OPC). This cement has increased lime content and contains higher c3s content and finer grinding which gives greater strength development than OPC at an early stage. The strength of rapid hardening cement at the 3 days is similar to 7 days strength of OPC with the same water-cement ratio. Thus, advantage of this cement is that formwork can be removed earlier which increases the rate of construction and decreases cost of construction by saving formwork cost. Rapid hardening cement is used in prefabricated concrete construction, road works, etc. The difference between the quick setting cement and rapid hardening cement is that quick setting cement sets earlier while rate of gain of strength is similar to Ordinary Portland Cement, while rapid hardening cement gains strength quickly. Formworks in both cases can be removed earlier. Quick setting cement is used where works is to be completed in very short period and for concreting in static or running water. Low heat cement is prepared by maintaining the percentage of tricalcium aluminate below 6% by increasing the proportion of C2S. This makes the concrete to produce low heat of hydration and thus is used in mass concrete construction like gravity dams, as the low heat of hydration prevents the cracking of concrete due to heat. This cement has increased power against sulphates and is less reactive and initial setting time is greater than OPC. Sulfate resisting cement is used to reduce the risk of sulphate attack on concrete and thus is used in construction of foundations where soil has high sulphate content. This cement has reduced contents of C3A and C4AF. Sulfate resisting cement is used in construction exposed to severe sulphate action by water and soil in places like canals linings, culverts, retaining walls, siphons etc. Blast furnace slag cement is obtained by grinding the clinkers with about 60% slag and resembles more or less in properties of Portland cement. It can be used for works economic considerations is predominant. High alumina cement is obtained by melting mixture of bauxite and lime and grinding with the clinker. It is a rapid hardening cement with initial and final setting time of about 3.5 and 5 hours respectively. 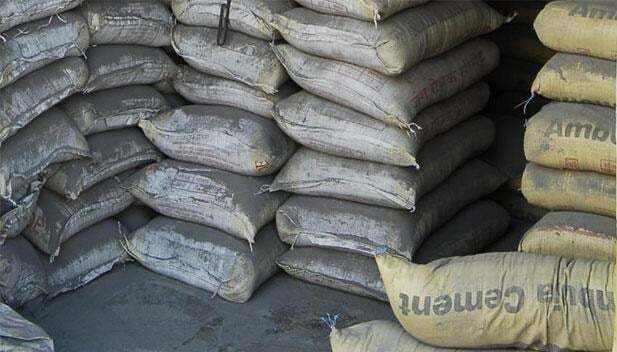 The compressive strength of this cement is very high and more workable than ordinary portland cement and is used in works where concrete is subjected to high temperatures, frost, and acidic action. It is prepared from raw materials free from Iron oxide and is a type of ordinary portland cement which is white in color. It is costlier and is used for architectural purposes such as precast curtain wall and facing panels, terrazzo surface etc. and for interior and exterior decorative work like external renderings of buildings, facing slabs, floorings, ornamental concrete products, paths of gardens, swimming pools etc. It is produced by mixing 5- 10% mineral pigments with ordinary cement. They are widely used for decorative works in floors. Air entraining cement is produced by adding indigenous air entraining agents such as resins, glues, sodium salts of sulphates etc. during the grinding of clinker. This type of cement is especially suited to improve the workability with smaller water cement ratio and to improve frost resistance of concrete. Expansive cement expands slightly with time and does not shrink during and after the time of hardening . This cement is mainly used for grouting anchor bolts and prestressed concrete ducts. Hydrographic cement is prepared by mixing water repelling chemicals and has high workability and strength. It has the property of repelling water and is unaffected during monsoon or rains. Hydrophobic cement is mainly used for the construction of water structures such dams, water tanks, spillways, water retaining structures etc.